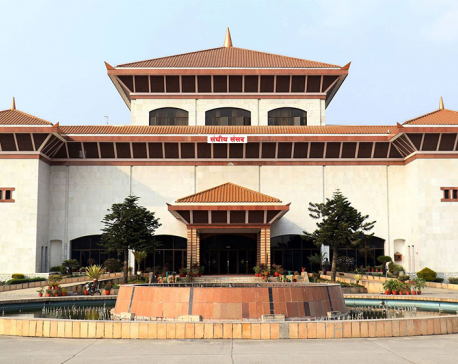 KATHMANDU, March 16: The government has registered a Security Council Bill at parliament, proposing special powers to the prime minister for directly endorsing an army mobilization decision through the cabinet in case of a national emergency. The decision will not have to be put through the security council immediately. Article 266 of the constitution has provisioned a seven-member security council for recommending control and mobilization of the army to the cabinet. The president, who is the constitutional head of the Nepal Army, shall issue the army mobilization order following a decision of the cabinet. The government has now proposed a prerogative to the prime minister, who is the chairperson of the security council, to recommending army mobilization to the cabinet on his own, in exceptional cases of emergency. “In case of a serious national emergency or when any delay in army mobilization would cause such an emergency and a meeting of the security council is not immediately possible, the council chairperson shall recommend to the government to mobilize the army,” reads section 6(3) of the bill. But the prime minister must endorse the decision through a security council meeting prior to forwarding it for parliamentary endorsement. The security council shall also recommend deployment of the army for the security of projects, places of national importance and heritage sites. This provision has been included following concerns over security for mega projects and for foreign investments in the country. The government has for the first time drafted a separate bill for the security council, in line with the constitutional provisions. It has been functioning under Section 6 of the Nepal Army Act. The constitution has envisioned separate federal law to define the duties and responsibilities of the council. Similarly, the bill has proposed tasking the security council with recommending criteria for the use and coordination of assistance from a foreign army during national disasters. Likewise, the council should draft policy related to weapons and armaments needed for the security bodies and recommend to the government for approval. The security council shall also recommend to the government about bilateral or multilateral assistance to the Nepal Army. Proposing expansion of its jurisdiction, the bill has authorized the council to seek information, records or suggestions from the central and provincial governments about issues of national interest, security and defense. Similarly, the security council shall advise provincial and local governments about national security concerns. The bill has proposed the attendance of at least five members of the seven member security council to form a quorum for meetings.